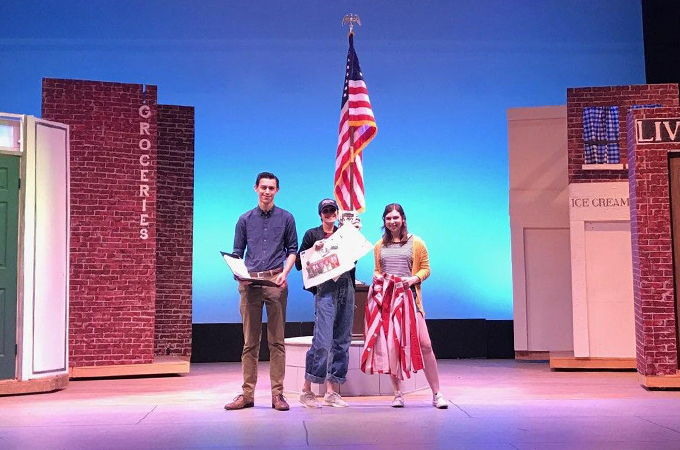 Future Bulldogs Jamison Stevens ’22 (left) and Mackenzie Green ’22 (right) work with teacher Jennifer Vincent ’03 on a Citrus Valley High School production of "The Music Man" that features a set modeled after historic Redlands buildings. As an alumna whose ties to the University of Redlands go back generations and as a teacher of future Bulldogs, I wanted to invite University community to a phenomenal production of The Music Man opening this weekend at Citrus Valley High School. After completing my bachelor’s degree in Studio Art (emphasis in Graphic Design) in 2003, I pursued a teaching career so I could share my passion for this field with young people. My experience at Redlands prepared me well for this path, given the many hands-on opportunities I had in the Art Department. Since 2011, I have been honored to teach Digital Art and Play Production at Citrus Valley High School in the Redlands Unified School District. We call the performing arts department (which includes the band, choir, acting, and play production) the Blackhawk Theatre Company. And this spring’s production of The Music Man is something special for those who love our University’s beloved hometown as much as I do. The Music Man tells the story of Harold Hill, a conman who poses as a boys’ band organizer, selling instruments and uniforms with no intention of providing music lessons. A romance develops between Harold and the town’s librarian and piano teacher, Marian, and it’s just a delightful story. The show takes place in 1912, and the more research I conducted as I designed the show, the more I saw that this exact story could have happened in the town of Redlands! With the help of the awesome book Images of America: Redlands written by the incomparable Larry Burgess and Nathan Gonzales, I designed the set pieces based on actual buildings from the past and present of Redlands. Our sets were inspired by Smiley Library, the Livery and Feed Stables building, and Billiard Hall, to name a few. Not only has the production created a fun and hands-on history lesson for my students, but it has opened their eyes to the rich background and downright amazing things that have happened in this place we are so lucky to call home. This is particularly meaningful to me, as I am the 11th person from my family to graduate from the University of Redlands and the 12th to attend the University. My sweet Grandma Marilyn “Skip” (Gartner) Flora married my Grandpa Bill Flora just a few units short of graduating; in her defense, it was post wartime and my Grandpa was one handsome and sweet man! Whatever your family background, I hope you’ll consider coming out to see our production of The Music Man, whose cast includes two seniors who have committed to the University. All proceeds go directly back into the program, which brings arts and music education to local students. The show opens Friday, April 27 at 7 p.m. and includes performances on Saturday, April 28 at 1 and 7 p.m., Thursday, May 3 at 7 p.m., and Friday, May 4 at 7 p.m. To learn more, visit thebtc.us or go directly to the ticket purchase page. Tickets will also be available at the door.